Location: Plieux, in the Gers departement of France (Midi-Pyrenees Region). Notes: Château de Plieux built in the nineteenth century to Plieux (Gers) is a castle "type Gascon.This is one of the last Gascon castles built in 1340 on the site of a castrum or castle mound, by the family of Faudoas. It consists of a rectangular central body and two square towers located on two opposite angles, whose names refer to the villages with whom they were probably eye contact: northwest, the tower Sainte-Mère-high 26 meters; southeast, St. Clar turn, leveled in the main body at an unknown time. Holy Mother tower probably served as a gateway to the village, with two doors, one on the outside, was later walled up and the other heavily reworked.The castle traditionally poor openings, was remodeled in the late Middle Ages or the Renaissance: they pierced are many bays which opened the view of the surrounding countryside to the Pyrenees, but at the expense of soundness. Perhaps we owe them the disappearance of the walkway which ruled the top of the walls with brackets supporting battlements. Some windows had to be resealed. 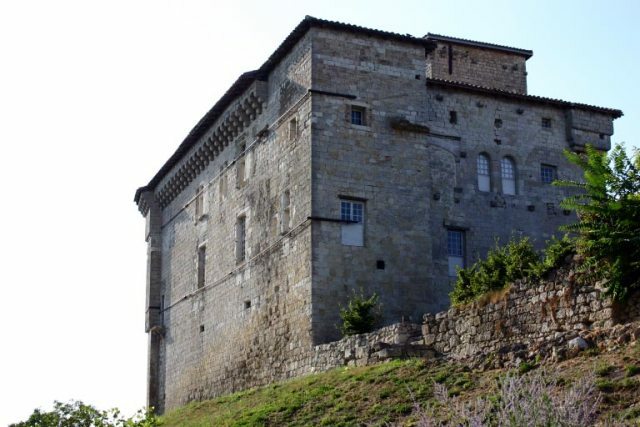 The presence of battlements on three sides of the building reflects the delayed construction and the ultimate evolution of the Gascon castle, which until then, at least according to witnesses remaining, were not provided with such improvements. Successive property of the families of Faudoas, Galard of L'Isle-Bouzon, the Poubersac, of Rochechouart, the castle was used rarely for permanent residence. Its function was more military, yet he did not have to undergo serious insult. The writer Renaud Camus, who lives, has made an important center for contemporary art exhibitions and cultural events. The castle was declared a historic monument in 1994.